What do you think of the Nets' new logo? FanSpeak: Greatest moments in Nets history? Johnson, Morrow, Brooks talk N.J.
Brook Lopez can score, big time. But his rebounding doesn't exactly inspire fear in opponents. NEWARK, N.J. -- After notching his 10th 30-plus-point game of the season and speaking to reporters, New Jersey Nets center Brook Lopez emerged from the locker room to a group of kids who couldn't wait to meet him. "Brook! Brook! Brook!" they yelled. "Brook, can you take a picture with them?" head coach Avery Johnson's wife, Cassandra, asked. "It seems like they love you, for some reason." The reason they love him, however, isn't just because of his ability to score the ball in the post. It's because they can relate to him. Lopez loves comic books. He reads graphic novels. He even appeared on the Disney Channel. Off the court, that's all well and good. It just doesn't translate well on the hardwood. Only two centers average more points than Lopez's 20.4 per game. But 17 are averaging more than his six rebounds per game. And heading into the offseason, that's where he needs to improve. In early January, when asked if he dreamed about the prospect of acquiring superstar Carmelo Anthony, Johnson responded, "No, I dream about our center grabbing 10 rebounds." Through 81 games, Lopez has only accomplished that "feat" 10 times. He's had only nine double-doubles after finishing the 2009-10 season with 33. He averaged more than eight boards that season, but has regressed since. There's no question he’s taken his offensive game to the next level. In his last six games, Lopez is averaging 32.4 points per game on 59.6 percent shooting. On Monday night, he finished with 31 points -- 11 of which were scored in the fourth quarter -- in the Nets' 105-103 loss to the Charlotte Bobcats. "From an offensive standpoint he demands the ball more,” said Johnson, who believes Lopez is becoming a more mature offensive player in this his third NBA season. "He'll even mention to me in a timeout or give me a signal in the game when he wants a certain play. That took him about 40-50 games to get there. And then just making strong moves. You don't see him settling for as many jump shots. You actually see him playing like a post center now. He's got a jump hook, his step-through moves, his turnaround jump shot. You see him getting to the free throw line." Lopez attributed it to aggressiveness. If only he could carry that aggressiveness to the defensive end of the floor, where he snagged just three boards on Monday night. "Again, we know he has a ways to go defensively in terms of defending the paint, getting over in the help-side defense quickly," Johnson said. "And rebounding the basketball. Getting the easy rebounds and the dirty rebounds." Those missing attributes -- flaws if you will -- are what separates Lopez from being as dominant as Orlando Magic big man Dwight Howard. It would be unfair if we failed to mention that Lopez is the only healthy Nets starter at this point. It would also be unfair if we failed to mention that Lopez has a painful calcium deposit in his arm that needs to be fixed at the end of the season -- or that he plays next to Kris Humphries, whose 10.4 rebounds per game rank fifth in the NBA. Those excuses aside, though, Lopez needs to take the next step next season and become an all-star. The player they believe will be a cornerstone -- along with star point guard Deron Williams -- for the foreseeable future. That is, if the don't shop him for Howard or a another superstar, of course. "I just want to continue to grow and I want to be someone the team can rely on down the stretch," Lopez said. "I know we've got a lot of good guys here. Whatever happens [in the offseason], [I want to play with] guys with winning attitudes and guys who most importantly want to be here for the long haul." 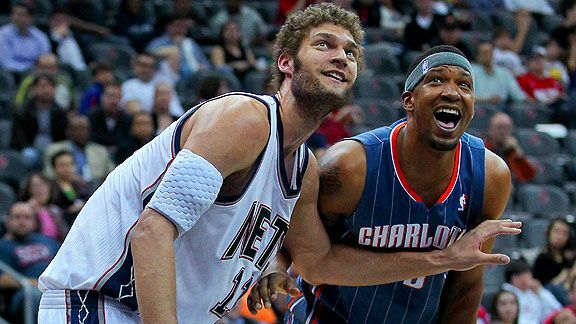 The Nets love how Lopez's offensive game is progressing. They just don't want him to finish 58th out of 60 eligible centers in rebounding rate next season. "I always go into every offseason working on everything," Lopez said. "By no means am I a perfect player in any area, and there's loads of areas that I'm very poor at. So I’ll be working on everything."